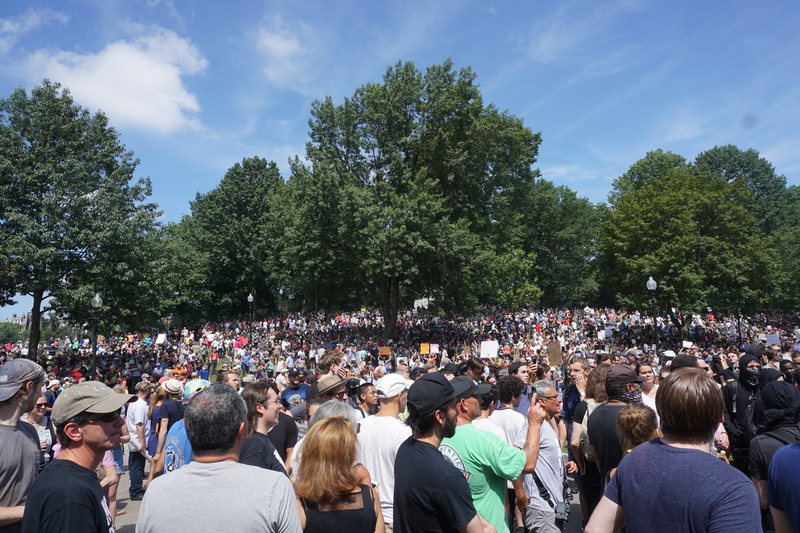 This past weekend, counter protesters flocked to the Boston Common by the thousands. They were protesting against a Free Speech Rally originally put on by the Proud Boys; an organization dedicated to celebrating masculinity and the West in a climate that is dead set on undermining both. Speakers featured Gavin McInnes – a personal favorite of mine, Cassandra Fairbanks, Kyle Chapman, Augustus Invictus and Joe Biggs. But following the chaos in Charlottesville, blue check mark Twitter began warning of a second nazi insurgence in the city on a hill. CNN also ran a story about other white nationalist rallies happening nationwide, including the Free Speech Rally being planned for Boston. They later updated their headline, substituting “white nationalist” for “far right” but not after the damage had already been done. And the media has the audacity to play the victim and act as though their perceived decline in legitimacy has anything to do with Trump. The Proud Boys are not nazis, white supremacists, white nationalists, or KKK affiliated. The group was founded by a Canadian immigrant married to a Native American woman with mixed children. Gavin McInnes constantly and vehemently disavows these psychos, and banned them from his group MONTHS ago. 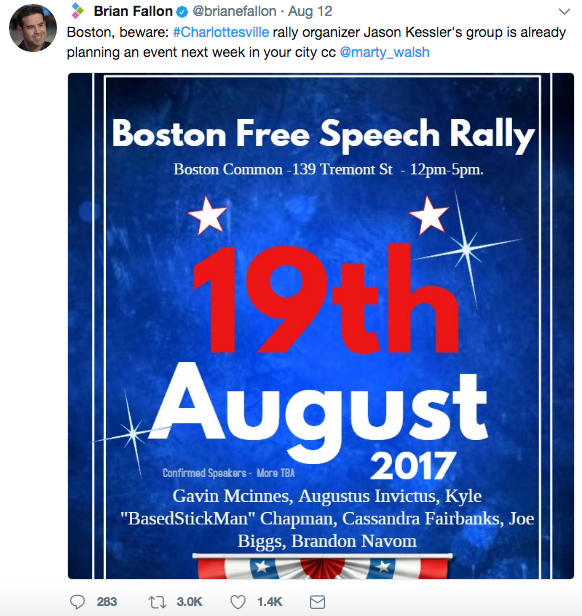 I was extremely excited to see an event like this come to Boston, but expressed concerns about Augustus Invictus as a featured speaker. Someone behind the official Proud Boys twitter account personally reached out to me, encouraging me to attend. I made up my mind that I would go. But after Charlottesville, everything changed. As death threats against the speakers and their families began to escalate and my very own mayor took the coward’s way out, speakers began to cancel one by one. As far as I know, Joe Biggs was the only person to attend on Saturday, and only 40 or so people actually showed up to hear him. Not because only 40 people in the city actually cared to hear what he had to say, but because only 40 or so people were brave enough to show up, knowing the professional, personal and physical risks of being branded as nazis, regardless of what they believed. So the story is told of brave Bostonians standing against bigotry in the thousands. The counter protesters get to feel good about themselves and post pictures with obnoxiously long and self-righteous captions about how they’re on the right side of history. Except they have nothing to be proud of, and don’t even know who or what they marched against. This event was being promoted long before Charlottesville happened. But as soon as the media saw an opportunity to take advantage of hysteria and tension, they seized it. And they are why we’re so divided. It’s not Trump or his administration; it’s the people reporting on it with no regard for the truth and not even the slightest attempts made at objectivity. If hacks like Brian Fallon actually cared about the truth, thousands of people wouldn’t have shown up to protest a free speech rally. They were there because they were told that they were protesting nazis. While at this rally getting footage, I witnessed with my own two eyes a Jewish kid that looked like he was in his teens with a shirt that said “Save America, Vote Republican” chased around the park by an angry mob chanting “nazi go home.” Though I wasn’t able to hear a lot of what he was saying because he was being drowned out by all of the people shouting at him, I was able to make out from what I did hear that he in no way sympathized or aligned with the alt-right. But none of the deranged psychopaths screaming at him seemed to care. All they cared about was the narrative. Of course, every individual is responsible for seeking truth for themselves and the actions they take. There are no excuses to be made for the people that allow themselves to be manipulated by the dishonest media when so much information is readily available to us. But when the media is telling people that everyone that disagrees with them is a nazi, how rational can we expect them to be? How open to discussion can we expect them to be? America will never come together if we’re allowing the mainstream media to control the conversation. We will never listen to each other, and we will never understand each other. If Trump has done nothing else, he has exposed them for who they really are. Liberalism is a disease…Let’s help fund a cure!